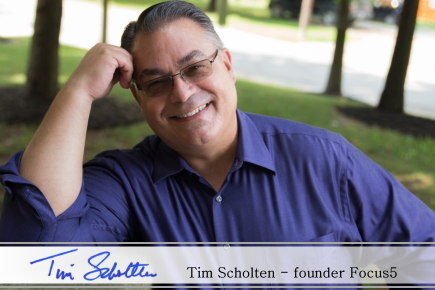 Tim Scholten is a veteran banking executive and founder of Visible Progress, the Focus 5 Process, the Focus 5 Productivity App, and the life-changing book, The Focus 5 Advantage. The Focus 5 Process was developed from Tim’s true life experience that he had to develop to save his career and his family’s livelihood several years ago. Based in the Columbus, Ohio area, Visible Progress is a leading consulting group that partners with financial institutions on smart strategic planning, immersive operations/systems review and inspirational change management. Guided by Tim’s expert hand, Visible Progress has earned a reputation for delivering exceptional return on investment while leading banks and credit unions through a variety of initiatives including bank launches, major systems launches and upgrades, strategic streamlining and cost-reduction projects and the development of top-notch call centers. Tim is a noted expert in strategic and operational planning, team building, market positioning and new business development. With more than 25 years experience as an executive in the financial services field, and having held leadership positions in such notable institutions as Huntington Bank in Columbus and First Michigan Bank in Holland, Tim is known as a straight-shooter and a passionate advocate for his clients’ success. As the leader of Visible Progress, and throughout his lengthy career in financial services, Tim has maintained an unshakeable commitment to providing his clients with an exceptional return on investment. This dedication to ROI is instrumental to every client proposal he develops and every recommendation he makes. Tim’s vision for customer service excellence, and building successful teams with a customer-focused mind set, was the foundation for his success in banking. It is that same vision that serves as the foundation of Visible Progress. An honors graduate from the University of Wisconsin Graduate School of Banking, Tim is also an active leader in his community, where he serves on the executive board of The Opportunity for Hope Foundation. Tim saw the need of businesses with great potential who were lacking the right discipline, focus, and training for optimal success. So in 2008 he launched Visible Progress to help these companies improve their probability for success. The resulting improvements have transformed the direction and results of these clients. Since then, he has release his book, The Focus 5 Advantage, the success and productivity app – Focus 5, based on his successful coaching career using the Focus 5 Process that he personally developed.